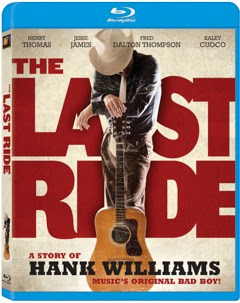 Ride off into the sunset with the most legendary country artist of all-time when THE LAST RIDE arrived on Blu-ray and DVD June 4 from Twentieth Century Fox Home Entertainment. Featuring an all-star cast including Henry Thomas (E.T. ), Jesse James (Jumper), Kaley Cuoco (“The Big Bang Theory”), Fred Dalton Thompson (“Law & Order”) and Stephen Tobolowsky (“Californication”), this powerful film retraces the final days of a true American icon. Hank Williams stands tall as one of country music’s giants. The Alabama native was more than just a troubled Grand Ole Opry star; he turned out to be one of the great composers in country music history. This list of Hank Williams songs is quite impressive when you realize how many of them have been covered by artists from all genres. My husband was really excited to get this title. He's been listening to music from Hank Williams all through his childhood because that's what his grandpa and dad use to listen to. So we sat down and watched it. I was surprised how much I got into the movie. It was really good. I loved seeing Kaley Cuoco from The Big Bang Theory in the movie as well, I thought she did a fantastic job. I love watching movies that are based off of a real life person. So I did what I normally would when something interests me after watching a movie and looked up so much info about Hank Williams. My hubby just shook his head and laughed. I also shared this film with my father in law who enjoyed it as well. He said from the stories he heard about Hank Williams they did a pretty good job portraying him. This is a great movie you can purchase for yourself or since Father's Day is right around the corner a great gift to give to your dad, grandpa or hubby. Also if you're a fan of country music this is definitely a great movie to watch. We actually have a Father's day giveaway going on that includes this movie. Head on over HERE to enter before it's too late! · “I'm So Lonesome I Could Cry” – This song seems to have been officially covered the most of any Hank Williams song! It has been covered at least 19 times, by artists such as Elvis, Dean Martin, Johnny Cash, Al Green and Keb' Mo'. · “Jambalaya” – Coming in second place, “Jambalaya” has been covered at least 16 times, but such greats as Jerry Lee Lewis, Emmylou Harris and The Carpenters and Lucinda Williams. · “Your Cheatin' Heart” – This song has been covered at least 10 different times! Artists like Beck, Elvis, Ray Charles, LeAnn Rimes and Fats Domino have all covered this classic. · “Hey Good Lookin'” – “Hey Good Lookin’” has also been covered at least 10 times by musicians like Jimmy Buffett, Ray Charles and Johnny Cash! Disclosure: All opinions are my own. I received The Last Ride on blu-ray at no cost for the purpose of this review. No other compensation was received.